The month of April got us thinking about what the general public sees as true, versus the actual truth. Don’t be fooled. There are a number of traditions in the Native American culture that have been caricatured and/or misunderstood by the American public, so we wanted to highlight a few that could use correcting. Correction: Native Americans have utilized beads in a number of ways throughout the years, including for trade, storytelling, gifting, recognizing status and incorporating meaning into traditional dress – each tribe using them in their own way. 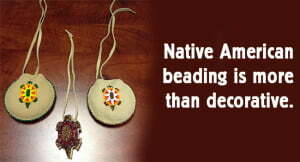 Beading is so woven into Native culture, that it is taught and practiced in schools in order preserve Native heritage. Near Halloween last year, we shared this insightful video from BuzzFeed, in which Native Americans tried on and discussed “Indian” costumes, which often contain feathers or beading. Correction: For the Cherokee Nation, their website explains that “the knowledge used by medicine people comes from other medicine people who came before them and handed down their ‘medicine’ to chosen ones. They train for many years and the medicine formulas, songs and other rites are handwritten in ledgers which have been handed down over time.” For the Cherokee, shamans are not psychic; rather, they consult with Traditional Cherokee on medical issues and life dilemmas, and advertising or profiting from these services is not accepted. Please note this information applies only to this one tribe’s beliefs and is not representative all tribes. Correction: Often, the American public makes sweeping generalizations about the spiritual beliefs of Native Americans, including that all tribes share the same beliefs or religion. Yet tribes, on their own websites, refer to a variety of religions and some Native people practice several spiritualities that do not seem in conflict with one another. While there is no one “Native American religion” common to all tribes, the Native American Church does practice Native spirituality and rituals and is present on numerous reservations. Location, community and beliefs unique to a specific population all contribute to the wide range of spiritual practices of Native Americans — just like they do for everyone else. Partnership With Native Americans cares about quality of life for Native Americans and respects their self-determined goals for their tribes. We see through the misunderstandings and work with those we serve, providing consistent aid and services that our reservation partners request. Help us continue this aid; donate today. This entry was posted in Humanitarian and tagged beads, beliefs, costumes, culture, Native Americans, spiritual, traditions, tribes. Bookmark the permalink. Trackbacks are closed, but you can post a comment.